For large periods of the game, the battle between the two sides was tight with a scoreless first half. This was in no small part a result of Real Madrid’s strategy for the match as they restricted Barcelona’s threat quite well. It was largely focused around stifling Barcelona’s ability to create from the midfield as they used man-orientations and fairly strong compactness to exert a fair amount of control. In the first clasico this season, Rafa Benitez opted to start James Rodriguez over Casemiro and played with effectively 2 midfielders behind an attack of Bale, Ronaldo, James and Benzema. The unsurprising result was that Madrid lacked any control in both parts of the game and were lacking an adequate structure both with and without the ball. Zinedine Zidane learned from the previous-coach’s mistakes however and Casemiro got his start at the centre of a 3-man midfield who received support from Bale and Ronaldo on the two flanks. This provided much-needed stability against one of the best teams in the world and allowed them to exert a much better control over the centre of the pitch. With the extra man in midfield, Madrid’s defensive game was largely based around a zonal system with numerous man-orientations during Barcelona’s possession game. By covering the men individually, Madrid looked to restrict Barcelona’s access to players such as Iniesta with Modric covering him closely whilst their own defensive access allowed them to maintain a level of pressure on the ball. Furthermore, these man-orientations allowed Madrid to emphasise Barcelona’s weaker positional structure which was another important component in the game. Compared to recent years, Barcelona’s spacing is less consistent and in this particular game they were unable to create strong enough structures through the middle of the pitch. 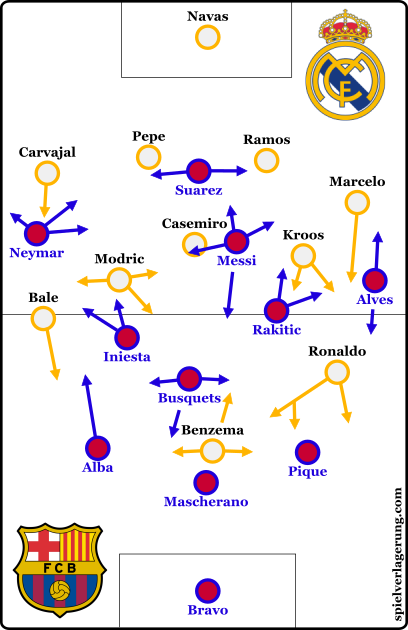 By occupying the relevant Barcelona players in defence, Madrid were able to stop Barcelona from playing cleanly through the centre whilst Iniesta and co weren’t able to develop positional superiority. Modric following Iniesta into wide positions. Especially in the first 30 minutes, there were some situations where Madrid became unstable due to these man-orientations. Modric was repeatedly being pulled out of position towards the left wing as he followed Iniesta’s wing-oriented movements and the centre was situationally open because of this and similar mechanisms. Despite this, Barcelona were unable to take advantage of these open spaces due to a mixture of Madrid’s access to the passing options and Barcelona’s weaker-than-normal spacing. The forwards supported the defensive efforts well to further enhance Madrid’s ability to effectively defend the centre. Benzema would often drop deeper onto Sergio Busquets to occupy him whilst allowing the deeper midfielders to cover the likes of Iniesta and Rakitic. With the inside orientation of Messi, Barcelona look to create overloads and free men through the central areas of the pitch. However with the support of Benzema’s defensive efforts in midfield, Zidane’s side were able to restrict Barcelona from opening up the centre as they usually do. Despite a strong defensive display, Madrid were hardly defensive-minded and to call them pragmatic would be far more accurate. When they were able to, Zidane’s side looked to take a defensive position high up the pitch and apply pressure on Barcelona within their own third to try and force long balls. Although this was at times risky due to Barcelona’s individual and collective pressing resistance and they could struggle to maintain compactness, it was fairly effective. To achieve this they would make use of the man-orientations which they exert in a mid-block to maintain defensive access higher up the pitch and restrict the number of passing options to bring the ball out. There was undoubtedly potential for Barcelona to situationally take advantage of these moments however their ball circulation in deeper spaces wasn’t effective enough to do so. The deeper players weren’t able to access the players in between the lines and the press wasn’t bypassed consistently enough. An interesting aspect of Barcelona’s shape was the asymmetry in the positional structure. This was created by the full-backs who were oriented very differently as the left-sided Alba played much deeper than Alves on the right. Acting on the right side of the pitch, Alves occupied high postions on the right touchline and served to stretch the opposition shape, thus giving Messi greater freedom to make his usual movements inside. This is very much a common feature of Barcelona’s game as they look to give the best player in the world freedom to move inside and it’s a shared role between Alves and Rakitic. Firstly, through Alba acting in the defensive line Barcelona formed the 3-chain on the first line of players and thus allowed Busquets to play higher up. Theoretically this gives Barcelona better occupation of the central areas of the pitch whilst maintaining the 3 players in the first line, giving a good occupation of the width of the pitch. Alba’s deeper positioning also meant that Neymar was given more space in higher positions on the touchline to create isolations. The Brazilian was given the ball quite commonly in wide areas where he looked to single out Carvajal to attack on the dribble. Aside from Neymar’s isolations, Iniesta also was provided with more space to make his wing-oriented movements and play-make from the left half-space. Thirdly, with him in a deeper position they were given better insurance against counter-attacks. Madrid’s strategy was largely based around counters through the two wide players who looked to use their explosiveness to make direct, space-gaining runs down the flanks. Through having Alba in a deeper position, not only could they control counters better through the back three and Busquets, but had greater protection against pace too. Messi inside in Barça’s asymmetry. Another element of the asymmetry was Messi’s role moving inside towards the 10 space. Again a common feature of Barcelona’s possession game, Messi commonly drifts inside from the right flank to act as a free-man. In doing so, a type of asymmetry is formed as Neymar usually takes on a role closer to the touchline where he can find isolation situations or make his strong diagonal movements to complement Suarez and Messi. Whilst Alves occupied the right flank in cooperation with Rakitic’s balancing movements, Messi’s central position added to the asymmetry of Lucho’s 3-1-2-1-3 shape. Under Guardiola, Barcelona were renowned for their excellent positional play founded upon the guidelines of juego de posicion. However ever since the legendary coach left Catalonia, these principles have gradually deteriorated as Barcelona have moved away from this playing philosophy. That isn’t necessarily a bad thing, as the Barcelona of the past two seasons can certainly challenge Pep’s team in terms of quality and performance but it has had an impact on the possession game. One of the biggest differences is the lesser consistency of the positioning. Under juego de posicion, the team have a set guideline which they follow rather closely throughout the game which results in a consistent positional structure. Without these guidelines, the structuring is not as patterned and more ‘free-form’. This was clear to see in Barcelona’s performance as their spacing lacked consistency and took on many forms against Real Madrid. After the opening 35 minutes of the game, the home side’s spacing was unclean and in many scenes not effective against the oppositional man-oriented defence. The connections between the midfielders were not sufficient in forming adequate passing options and the positional support across the structure wasn’t very strong. In some parts a result of this deficiency, Barcelona started to lose control of the game early in the 2nd half and after some excellent work by Madrid’s best forward in Marcelo, their lead established by a Pique head was quickly lost. Without the sufficient level of spacing as well as a few other factors, Barcelona weren’t able to carry the same threat in possession and their ball circulation lacked penetration against Madrid’s defence. There occupation of the centre and 10 space was lacking and the pressure on Real Madrid’s defensive block was insufficient for large periods of the game. Barcelona’s poor spacing and lack of 10-space occupation. With weak spacing higher up they were unable to establish effective attacks. After restricting Barcelona’s play with the ball, Madrid won a tight game through a late Ronaldo goal for a successful first clasico for Zidane. Although the game is quite irrelevant for the outcome of the league, it’s a nevertheless promising win for the young French coach as he learned from the mistakes of his predecessor. Is good spacing a key characteristic of any effective team or just juego de posicion? Any team. I will be covering the concept in detail hopefully some time in the future. How does teams overload a certain area of the pitch while maintaining good spacing? You don’t need to cover every space of the pitch. You can leave out some spaces which are unlikely to be reached in your attack or the counterattack. You then have one or two (or even more) Players who can be positioned elsewhere to create an overload. For example Peps Barca often vacated the space directly in front of the opposition CB’s to have a numerical advantage in midfield. Later on in the attack these spaces where attacked by the likes of Messi (from the center) and Villa/Henry/Eto’o/Pedro/Sanchez (from the wings). Other teams leave some spaces on the wings to overload the center or vice versa.